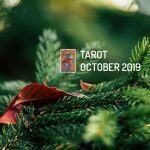 In Tarot for October 2019, The Fool is the arcana that dictates what will happen during the month and it represents impulsiveness, spontaneity, heterodoxy, the unconscious mind and precipitation. A special card carries the number zero. The arcana could indicate the start of a circular path that the tarot represents as much as its end. What it does always reflect are changes in a person’s life, whether they are the beginning or end of something. The usual thing is that this peculiar character impels us to be spontaneous, to throw ourselves into the world in a crazy fashion, without knowing what may happen next. However, in spite of the uncertainty about what can happen when acting this way, discovering something new or the hope of something better happening to us push us past our fears. Undoubtedly, it is a positive card because it manifests energy, being on the forefront of action, and impetus. By ignoring the orthodox ideas and prejudices that dominate our environment we can move forward, feel more liberated and discover things that were impossible in our previous phase of submission to established norms. The character that represents the Fool is someone halfway between a buffoon and a vagabond, with strange clothes. He is situated next to a cliff that he will have to descend. This precipice is the material world which he is going to launch himself into. An unknown world that he will walk in while armed with his impetus and lack of prejudice. Also, he will go on his new path with just one thing to carry his things. But he certainly does not know what the bag will contain, he will discover it as he advances through life. The dog that accompanies him acts as a mentor, the friend that pushes him to learn from everything that happens to him in his journey. In Tarot for October 2019, The Fool looks upwards, towards the spiritual world, so that it may serve as a support and guide in his journey. This spontaneity, innocence and desire to start a new stage in life can be reflected in the sentimental world. That means that we will let ourselves be carried away by our feelings, freeing ourselves from prejudices, thus allowing someone to appear who previously would not have matched the profile of someone we would be looking for but who really is the person who makes us feel genuine. On the other hand, we will have to be careful about health, because mental problems could arise, such as obsession or depression. Money must be controlled well because this will be a time when it is easy to fall into wasteful spending habits. A bit of restraint will not hurt from time to time either.